I cooked one of my magazine recipes today…it was a lamb curry. It was meant to be shanks but it’s easier to bone and dice a shoulder. (Sorry to all my vegetarian and vegan readers, but I’m an omnivore.) Anyway, in honour of that lovely creature who is now my dinner, here is lamb and ewe. I used to draw stylised sheep like this all the time, it’s quite a simple shape for stencilling and stamp making, but this is the first one in ages. I need to do my online portfolio. It’s a job I loathe but it has to be done. I’ve registered the domain, selected the template and am now populating it with text and images. So there are lots of idea sketches in my book at the moment, and it’s an excuse to bring out the colourbox. We crossed the border into Manitoba and then Saskatchewan. Both are relatively flat and full of farms growing various grain crops, but always with a few trees on the side. It was a much better day weather-wise, being rather sunny, though I was not getting out at Winnipeg – -7C is by far too cold for me. Tomorrow (Tuesday) we stop at Edmonton then Jasper. I don’t often do a spread in my sketchbook, but the land is so immense, you need all the space you can get. I’ve been pretty timely of late, making the concerted effort to draw and post a couple of pages every day, but the brain is slowly running out of inspirations. Or maybe it’s been sidelined by fighting the cold that is going around at the moment. So I am back to drawing objects from around the house, such as my new(ish) sushi dish set, in woody 3-in-1 and pen. I can’t be doing resolutions; why set yourself up for failure? Instead, I am going to have New Year’s Ambitions. Mine are simple: 1. draw more, 2. do things that scare me, 3. be happy, though not necessarily in that order. 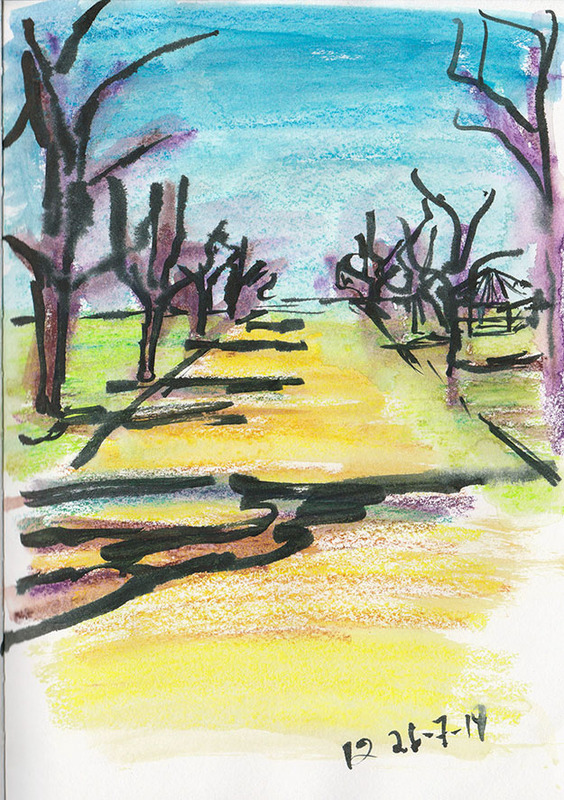 Draw more is an easy one, today I completed six pages in sketchbook, including this one of bare trees from Greenwich Park. I was rather early this morning, on the way to work, and with the heavy overnight cloud it was still v.dark and the lights look so pretty as they twinkled over the Thames. I would like to thank all my followers for their company during 2013 and hope they have a fabulous New Year’s Eve, wherever you may be, and all your dreams come true in 2014. May it be a creative year for you. Still can’t draw a straight line to save my life….